She released an album called, “Diploid Love” in 2014. It was rock solid and sassy as hell, in the way that Joan Jett was. In the way Courtney Love wishes she could be. In a way that should have caused more waves than it did. Perhaps the timing is not right for guitar based, female fronted, punk laced rock and roll. Whatever the reason, the tunes on that album are so tight, if you stuck little chunks of coal in there, they would come out diamonds. The songs are simplistic, yet arranged and delivered with these touches of attitude that are all Dalle. It’s whiskey smooth and scarred with velvet… making each line, each word, each thought push through any and all expectations with an impossible to ignore intensity. ‘Don’t Mess With Me’ has over 1.5 million views, so Brody Dalle’s fans have followed her into her solo work, even if the industry has not. Her song writing has honed itself into assaults of compact, brass-knuckle punches of indie punk rock that tear with their hooks as much as they pummel with their riffs. ‘Rat Race’ is a more straight-forward example, but pumps with a healthy heartbeat of rock and doses of classic Dalle howls. If the name and/or voice sounds familiar, but the image does not, it might be from Brody Dalle’s past music. Working backwards from her solo album, the band that preceded was called, “Spinnerette”. They only released one album, but it was excellent, showing a departure and evolution in Dalle as a songwriter and musician. This song, “Ghetto Love” should have been a monster hit. At least online it gets enough love on the web to know she has her appreciative fans. One of the main reasons all the work above came built in with legions of fans, was because of Brody’s first band, The Distillers. When Brody was 16 and living in Melbourne, Australia, she met 29 year old Tim Armstrong, frontman of punk band Rancid. Two years later, they were married and then 18 year old Brody found herself in Los Angeles with a punk rock husband, a punk rock band called The Distillers, and a landscape that was seeing a resurgence of the genre. This was made possible both through the initial gold rush of the online sales making old punk available, and a new school of kids getting exposure through the Warped Tour and its initial rise as one of the premiere summer tours of that time period. Releasing three albums total, The Distillers wrote edgy, catchy punk tunes that skirted the edges of so-called ‘mainstream punk’ as exemplified by bands like Blink 182 and Sum 41… essentially any punk band with anything that can be found on a calendar in their name… but managed to keep a nail hard edge puncturing the delivery. This was mostly accomplished by Brody’s distinct, raw, dirt-choked delivery and caterwauling howls that gave a street cred way more than any mo-hawk could. ‘City of Angels’ shows the classic Brody growl that made The Distillers so much more than a punk band, turning her slur of lyrics into a pub sing-a-long. ‘Drain the Blood’ was the first track off The Distiller’s last album released, “Coral Fang”. 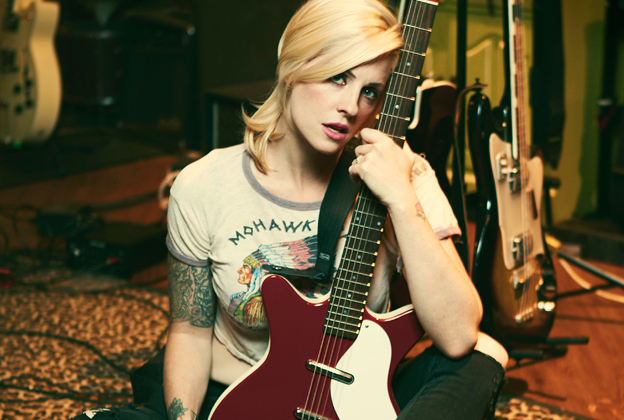 Brody Dalle is currently hunkered down writing a new album and also being a mom to her three kids she has with current husband Josh Homme, better known as the frontman for Queens of the Stone Age and ex-guitarist from seminal awesome Palm Dessert scene definers Kyuss. She seems to check her Facebook page periodically, so drop her a line and tell her how much you like her music. And this was too cute not to include… little girl interviewing Brody Dalle.